Since summer 2013 the website of Atgimimas weekly, where I worked from 2005 to 2011, is down. For this reason many of the links do not work. I will look for possibilities to retrieve my articles from the archives of the weekly. Report from a meeting with Olli Rehn on EU enlargement, Brussels, (Atgimimas, September 2008). As a part of the prize for the European Young Journalist Award, a group of awarded young journalists was offered an opportunity to meet Commissioner Rehn and discuss EU enlargement. During the press conference, Mr Rehn said it was certain that Croatia would become EU’s next Member State, unless Iceland were to apply in three weeks. As the economic crisis started to swing European economies, Iceland indeed applied. Liberty, equality… expulsion – on Roma evictions in France (Atgimimas, 02/09/2010). Related blog entry here. 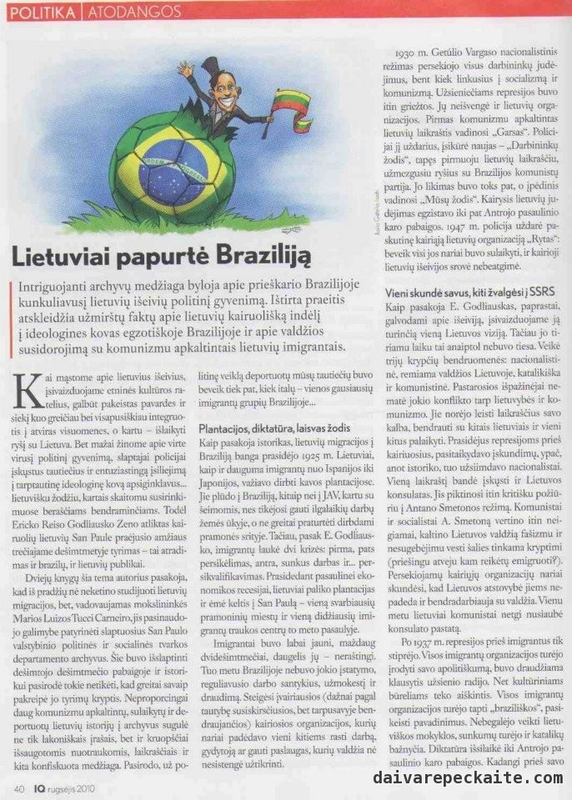 Nationalism in Europe (Atgimimas, 26/06/2009), also republished by leading news portal Delfi. This article compared and analyzed the rise of ultra-nationalism in Europe. Defending ideas or milking Brussels? – European Parliament elections in 2009 (Atgimimas, 12/06/2009). This op-ed argued that the common position of politicians running for European Parliament elections in Lithuania that they were going to defend Lithuania’s interests is not quite in line with the duties they will have as MEPs. Exhibition ‘Hitler and the Germans’ in Berlin (Atgimimas, 05/11/2010) – a report from a controversial exhibition in Berlin, which for the first time after WWII brought Nazi symbols to public space (in posters advertising the exhibition). In addition to documents, artifacts and explanations about how the Nazis succeeded in brainwashing large parts of the German population, the exhibition contained experimental Hitler-themed art. Do politicians care about us? – comment on the extent to which electoral platforms of the main political parties in the 2012 general election reflect issues relevant to women (Cosmopolitan, September 2012 – scanned). Dr. Nida Vasiliauskaitė, philosopher, eyewitness of the conflict in Abkhasia (Atgimimas, September 2008).